Does the Bible have any relevance in the 21st century? In this thought-provoking book Jim Vincent asks whether the Bible can still be considered divinely-inspired and whether its moral code has any applicability today, before going on to examine the Old and New Testaments in detail and to assess how much of them remains acceptable to the unbiased reader. The concluding chapter argues that the church must set aside its traditional view of the Bible as its holy book if it is to grow into adulthood and present a Christianity that is both credible and contemporary. It proposes that the church, as also the individual, may find a new lease of life in freeing itself from the constraints of ‘holy scripture’ and in evolving a new form of non-exclusive Christianity that is adaptable to changes in science, psychology, secular law and society. The book is written from the perspective of the Christian Agnostic/Atheist who finds it impossible to reconcile large parts of the Bible – and the doctrines that flow from it – with modern thought. It is not an unmitigated attack on the church or the Bible. On the contrary, it represents a positive recommendation for change. The book is not intended for the scholar. It is written for the general reader who has an interest in contemporary Christianity and its future – and, indeed, in whether Christianity can be said to have a future at all. This book was written out of an increasing inability to accept huge swathes of the Bible, as it is traditionally presented by the church. I came to realise that dwindling church attendance over the past 100 years is due primarily to the increase in education and the notion that people should think for themselves. The inevitable consequence of this is that the vast majority of people no longer consider the Bible to have any relevance. 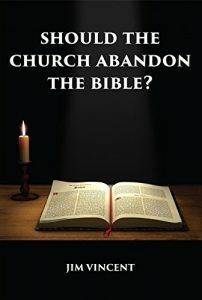 Hence, the question I raise in this book: Should the Church Abandon the Bible? I looked round at the kindly, decent faces of my neighbours. I had no doubt that they were altruistic, compassionate and intelligent; that they would cause no intentional harm to man nor beast; and yet, here we were, in the twilight of a late March evening, listening to – and thanking God for! – an account of blatant superstition and vindictive savagery. The dichotomy was staggering. Could the benign and courteous people around me really believe that there was anything in this story to celebrate or to revere? Or were they all, as I was, sitting there with a sense of deep discomfort and bafflement? I shall never know, of course, because neither I nor anyone else stood up and raised a protest. It is always difficult to protest against long-established tradition. The Passover rite has been central to Judaism for several thousand years; and since the 1st century AD it has been claimed by the Christian church as a symbolic precursor of the sacrificial and redemptive death of Jesus, the Lamb of God. In fact, the story of the massacre of the Egyptian firstborn and the release of the Israelites from captivity, is almost certainly the stuff of myth. No archaeological or historical evidence has been found to substantiate the biblical claim that the Israelites were enslaved in Egypt, and the majority of scholars and archaeologists consider Moses to have been a purely legendary figure. Nonetheless, the story is instructive for what it can tell us about the bible and its relation to Christianity. In the first part of the narrative, Moses and Aaron are instructed that each household is to take a lamb without blemish, keep it until the fourteenth day of the month, slaughter it at twilight, daub its blood upon the doorposts of the house, and so on, for the purpose of securing immunity from the wrath of God. This is, from any modern standpoint, a prime example of irrational occultism. Secondly, we are asked to believe that God, in furtherance of his own purposes, brutally wreaks vengeance upon tens of thousands of innocent children and animals. Preposterous and abhorrent as this idea may seem to us now, it appears that the ancient world saw no incongruity in it. The killing of the Egyptian firstborn was merely one of many acts of retribution, savagery and intolerance which the Old Testament writers ascribed – without a trace of compunction – to God. It is inconceivable, though, that the contemporary reader should consider such stories as anything but primitive and outmoded. And yet, as part of the holy bible, they are still held by the church to be sacrosanct and of continuing value. This is undoubtedly a stumbling-block for many – Christians, agnostics and atheists alike. The number of people able to accept this claim has been in decline for at least three centuries, and the number seems certain to decline further unless the church is prepared to radically revise its stance on the bible. Over the course of the following chapters we shall consider how much of the bible may still be acceptable to the unbiased reader, and to what extent the church may continue to claim it as its holy book and the basis of its teachings and beliefs. In short, we shall pose a question which some may find almost unthinkable: Should the church abandon the bible?